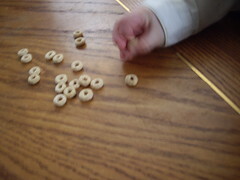 Several days ago, I wrote an article about the influence of the Fruity Cheerios brand on my two year old child. That article spurned such a tremendous number of responses (including more direct email responses than I’ve ever received to any individual article) that I thought it would be fair to post a follow-up article discussing some of the ideas brought up by the responses. Both points are quite true. The solution of simply putting generic cereal in a name-brand box doesn’t help at all with branding and it also eliminates trust just to save a buck or two. Not worth it. Freedom of choice Other readers argued clearly and effectively on behalf of preserving my son’s freedom of choice. I should allow him multiple choices at breakfast and encourage him to choose the healthier and more cost-effective options. Better yet, I should make sure that all of the choices I do offer him are already rather healthy options. This is something we already do at home. Most breakfast opportunities are choices between toast (my son’s favorite, actually), oatmeal, and two (or so) types of cereal, with other choices sometimes popping up on occasion (bagels, eggs, etc.). He usually either chooses toast (or bagel) or one of the cold cereals, even if other options are available. I do make an effort to ensure that all of the options are at least reasonably healthy, though. Don’t sweat it; just use coupons Quite a few people argued that a two year old isn’t really that affected by brand recognition, so it’s not a big deal. Plus, with coupons, Cheerios can be purchased very cheaply, so why not simply get him the cereal that he wants? With regards to where to buy cereal for cheap, if you buy it in bulk, Sam’s Club’s normal prices on an enormous double-bag box of various kinds of Cheerios is cheaper than either the generic or the coupon-reduced Cheerios at other grocery stores per ounce. So, when we buy cereal, we buy it in absurd quantities that usually last a couple of months at least. Eat generics together A few additional readers suggested that I eat the generic cereal alongside my child to demonstrate that I approve of generics and like them. This was actually my favorite suggestion of the lot. My children and I eat the exact same thing for breakfast every time we sit down together to eat. However, this does bring up the very strong point that you should talk to your kids about what you’re eating and consuming. Talking to your children (actually, to any children that you might be close enough to to eat breakfast with) about such things is a vital part of teaching them about life. Our solution So what’s our solution to the whole situation? We dug into the cupboard and pulled out a few clear Rubbermaid containers into which we’ll be putting the cereal from now on. We’ll show our son what we’re putting in each one, but afterwards we’ll let him choose from among the unlabeled, unbranded containers, basing his choice solely upon the contents. Most important, though, this is a great opportunity to talk about why we purchase stuff. Having Dora the Explorer on the box might make the packaging more interesting, but we’re not going to eat the packaging, are we? What matters is what’s better inside the box – and what food (not container) is the best value for the dollar.